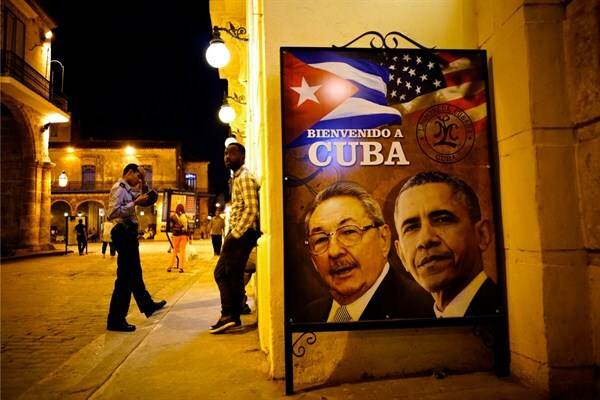 A poster of Cuban President Raul Castro and U.S. President Barack Obama outside a restaurant in Havana, Cuba, March 17, 2016 (AP photo by Ramon Espinosa). President Barack Obama’s trip to Cuba on March 21-22 marks a pivotal moment in the unfolding process of normalizing U.S.-Cuban relations. In the 15 months since Obama and Raul Castro declared the end of the cold war in the Caribbean on Dec. 17, 2014, there has been just enough progress to justify the historic presidential visit. But much remains to be done. By underscoring the commitment of both presidents to prioritize better relations in the time they have left in office, the trip should energize their government bureaucracies to accelerate the pace of change.